Comprised of an array of high quality materials, our "Director of First Impressions" Funny Name Plates will help to ensure you don't lose your sense of humor while at your place of work! The 2" x 8" comes in several color combinations and on one of our 4 metal holder options. Not all desk plates have to be full of official titles and critical information. 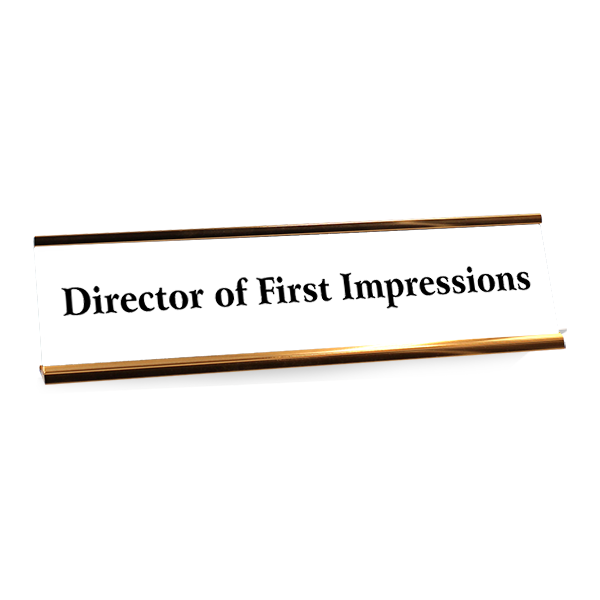 Have some fun this the "Director of First Impressions" name plate. Nothing gives off the impression of a great work environment quite like a witty high quality desk name plate! View our wide assortment of styles for your choosing. Remember these 2" x 8" desk plates are meant to be humorous and show unofficial titles. All of our nameplates are engraved on plastic with an aluminum desk holder. Crafted to endure for a long time to come, these amusing office desk plates will lend just the perfect level of light heartedness to any type of desk. Grab your gag gifts for work today!